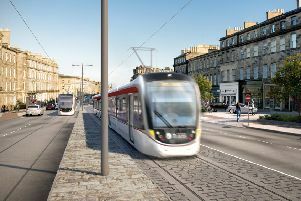 Edinburgh councillors have backed controversial plans to take the tram to Newhaven – despite community fears the extension could “compromise public safety”. The city council’s transport and environment committee voted to endorse the final business case for the project, which will now go before the full council, recommended for approval, on March 14. If approved by the full council next month, the extension would be funded by borrowing paid back by future ticket sales – meaning no money is being taken away from public services.It will also be funded by a £20m dividend from Lothian Buses. Conservative transport spokesperson, Cllr Nick Cook, raised concerns that Lothian Buses could see “significant operational disruption” leading to “higher fares and possible job losses” caused by the overhaul. He added: “A decision on the tram is a choice. The money could be spent on other priorities. This is not a case of tram or nothing – to claim so is simply false. Senior responsible officer for the tram project, Hannah Ross, said: “A delay to wait for the inquiry would cause difficulties in retaining the advisory team and contractors being told to wait could incur a cost to the council. Ms Ross told councillors that a business support fund of £2.4m, will include support that is “tailored for the variety of businesses on Leith Walk”. Community councillors raised concerns about the proposals. Andrew Mackenzie from Leith Links Community Council said that Constitution Street could become a “sterile two-way tram corridor” and that the plans will “compromise public safety”. He added: “Constitution Street, just 12 metres wide in some parts, is too narrow for the tram. Liberal Democrats are also opposing the plans. Lib Dem transport spokesperson, Cll Gillian Gloyer raised Brexit risks. Green councillors have asked for more assurances that Lothian Buses will not be financially impacted by the project. Green transport spokesperson, Cllr Chas Booth said: “If that risk is realised, it could have really serious impacts. We need to treasure our bus services. Councillors voted seven to four in favour of referring the final business case to full council for approval on March 14. Transport convener, Cllr Lesley Macinnes, said: “This project is one of the most important things we can do for this city.